The Honorary President of Sony Corporation, Mr.Ohga Norio, has generously donated to the erection of the Karuizawa Ohga hall. We fully appreciate his generosity and welcome the music hall as we have been wanting one for a long time. Here in Karuizawa, which was discovered by missionaries in the Meiji era, we have been striving to maintain our area's beauty in keeping with nature, as it is situated in a wonderful environment and regarded as a top resort area. We hope that the high level of tradition and culture, as started by our ancestors, will continue into the next generation with a view to being international and looking toward the future. To understand the real culture, it is important to be deeply intimate with it all the time. Besides playing music and appreciating it, teaching people to take part in cultural activities positively will help the real culture to take root in the area. 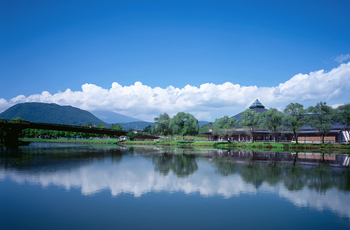 We hope this musical hall will create opportunities to hold many meetings and exchanges between the people of the town and visitors through the beauty of nature and the impressions of the music. 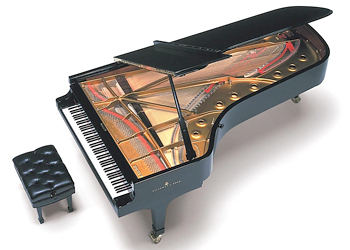 This famous instrument, a Hamburg Steinway Concert grand piano (D274 No. 427700), was brought by the great 20th century Italian pianist Arturo Benedettu Michelangeli for his visit and performance in Japan. Having left a reverberating mark throughout the world before passing away in 1996, this donation was made to our hall. This craftsmanship has been supported for many pianists for pianos by Steinway & Sons, and has been introduced into more than 90% of the world's renowned concert halls. The D274 series is the top echelon of Steinway & Sons' line-up, and this piano, chosen by the completely uncompromising master Michelangeli to bring from his homeland for abroad performance, can be said to be a most valuable collector's item. From now on, the sound this renowned instrument brings can be appreciated at concerts and recitals held at Karuizawa Ohga Hall. Whenever I come to Karuizawa, blessed with fresh air and beautiful nature, I feel refreshed in body and soul. Walking through the pine forests and listening to the singing birds brings music to my heart as inspirational as Beethoven's. On noticing a lack of a musical hall in Karuizawa, I decided to establish one, after resigning from Sony Corporation, on January 15th, 2003. After a lot of research, the pentagon shaped hall was built as it would have the ideal sound effects. The warmth of the timber is said to add to the depth of sounds for years to come. Henceforth, I am looking to the future with this hall developing a musical culture here in Karuizawa. 2005 Jan.31 "Seating Arrangement" has been updated. 2005 Jan.31 "Detail information about seating" and "Hall Tour" have been newly added. 2004 Oct.20 Karuizawa Ohga hall will be ready to open by "Golden Week" 2005, which is around the end of April and beginning of May. 2004 Oct.20 The ticket office will be open in January 2005.